The blue agave, which is also known as century plant, boasts grayish-blue spiny leaves and grows to a height of 6 feet. At the end of its lifespan, a tall flower stalk spikes high above the rest of the plant to flower during its final season. Although the plant dies after blooming takes place, smaller offshoots appear around the old plant. To grow century plant in a new location, you will need to uproot an offshoot and replant it in optimal growth conditions. Blue agave propagates easy from the small shoots that come up around the mother plant. Look for small, bluish-colored sprouts coming up next to larger century plants. You are actually doing the mother plant a favor by preventing too many daughter plants from crowding it out. Wearing gloves, carefully clear away dirt and vegetation and determine from which direction the root is coming. Normally, this is toward the larger century plant or mother plant. Don gloves and dig up the small century plant shoot and as much root as possible. Be careful not to get poked by the larger plant. 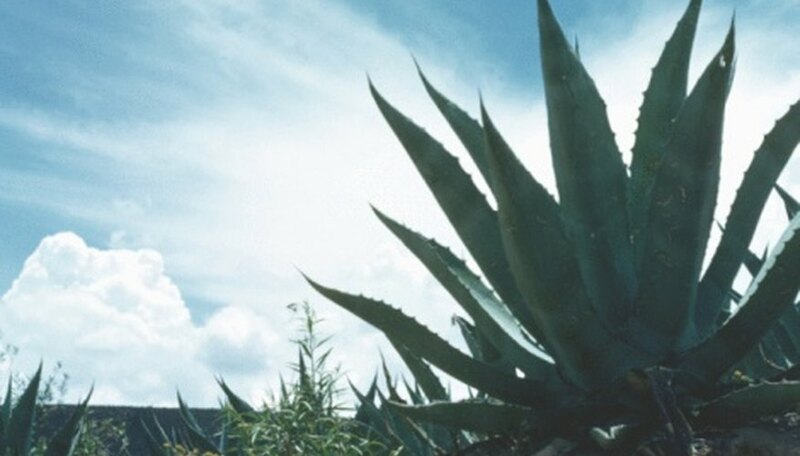 Century plant or blue agave juice may cause a rash so avoid getting any on your skin. Wrap the shoots and soil in burlap or place in a cardboard box until you plant them. Keep the shoots and root cutting damp. Locate an area where you would like to have another large century plant. Be aware that the small shoots will be large agave someday. Plant the root cuttings about 6 inches deep, with the bluish shoot at the end of the root about 3 inches aboveground. Cover with soil and water every few days at first, then once a week after the shoots are rooted. Don't plant blue agave or century plants near where children play since they produce dangerous thorns.